Net Promoter Score has served the industry very well as the standard in satisfaction intention, and can now be enhanced by adding explicit customer satisfaction data, influence and customer reviews already on the web. NPS ,while effective at capturing the intention of advocacy, does not measure actual advocacy or detractions that occur in the social web. As a result it’s difficult to capture the entire ‘net’ experience as the social web has demonstrated. Customer Satisfaction: Customers can now provide ratings, reviews, and other critiques in online review sites. Influence: Not all customers are created equal, in fact some customers have have great breadth of reach (like Celebrities on Twitter) or have depth in knowledge (expert blogger in your market). Referral Activity: No need to ask “how likely” they are to refer, you can see them do it live. Companies must value both the total customer satisfaction as well as influence and advocacy behaviors in order to provide a holistic example of the modern customer. Net Promoter Score This is the mainstay of customer satisfaction measurement and shouldn’t go away. It’s easily understood, well documented, and is a useful metric to overall ‘referral intention’. (Intention doesn’t measure actual behavior, just the likelehood you would) Support exit surveys, primary research surveys, work with Satmetrics, the owners of this methodology 1-10 Referral score: Promoters (9-10 rating), Passives (7-8 rating), and Detractors (0-6 rating) This is the standard default measurement, yet needs additional factorials to represent the modern customer. Influence (Absolute) To determine if a customer is influential to others, such as celebrities, top bloggers, analysts and media. This doesn’t necessarily mean however they are trusted by your specific market. There are a variety of secondary sources such as brand monitoring firms, like Buzzlogic, Radian6, as well as reputation management systems like Rapleaf. Your PR firm will have this list of absolute influencers, and their Twitter/blog/RSS numbers are good indicators Total possible reach, frequency of publication. These large influencers can cause mainstream media to shift attention, and will impact SEO, but don’t expect your actual consumers to trust them as much as they trust their peers. Assume high scoring at this level is towards the wider part of the funnel and may influence the lower elements. Influence (Relative) These are individuals that are ‘experts’ in your particular market. While they may not have mainstream appeal, they may influence consumers directly. For example, bloggers that write a dedicated blog to your market, or super reviewers that provide detailed reviews about your products in online sites Online communities, Technorati data, and brand monitoring firms Unlike Absolute Influence, we’re looking for depth –not breadth of ability. Look for how detailed, knowledgeable and how much they engage with prospects and consumers. This measurement must be factored into the overall formula as they have direct influence during the decision making stage in lower funnel. Advocacy (Intention) Data that indicates a prospect is ‘willing’ to purchase, but has not yet. The difference here is that they do so in public. Wish lists, shopping carts, or intention based data sources like Plancast, Facebook Events, Tripit, Dopplr. This data is difficult to get, as it’s currently not aggregated. Expects Social CRM systems to emerge that will help to assemble all this data around a single profile. Intention data is has high potential and therefore value, but low accuracy. Expect to factor in the chance that individuals will not move to the next stage, so conduct weighted averages here on probability. Advocacy (Purchase, or Post Purchase) This is the most key measure, as it measures when customers actually explicitly share with others that they have purchased a product, and may have posted an opinion, influencing others. A variety of locations like Twitter, review sites, blogs, and social networks. See how vertical based review sites are emerging like GDGT, where consumers share their technology products with their peers, influencing purchase behavior. Since you’ve already factored in their influence from above, you’ll add sentiment and accuracy. The key that most marketers don’t realize is that here’s the opportunity to be proactive. If there are positive reviews, figure out how to broadcast them to other channels, see how Bazaarvoice and Zuberance help brands with this. For negative reviews, the company can contact the negative reviewed to provide updates to service or product and request a second review. SUM Total Social Customer Value attempts to measure the entire value of customer satisfaction, influence, and advocacy in both intention and historical data types While still early, expect this data to be collected into a social CRM system, then be exported to business intelligence software systems like SAS, Qlikview, Oracle, SAP, Microstrategy, and others Adding all these factorials will develop a more accurate view of social customers While early and mainly theory, I know of a few brands that are attempting to scrap this data together and glue it together. Expect a new analytics agency to emerge that will help aggregates this. The above matrix is a formula to develop your Total Social Customer Value (TSCV) yet will require modification and customization for each company, as different verticals have higher rates of customer social activity. For example, technology, consumer product goods, and hospitality industry have a high degree of customer interactions –while component parts or specialized industries like tractors may not. You’ll need to develop a formula, use your social CRM system to track this and eventually use business intelligence software that can calculate this. My goal was to define how measurement of customer satisfaction, influence and advocacy have changed due to the social web, yet there are few challenges to this methdology, which I’m happy to point out as an industry analyst: 1) This is new thinking and not everyone will get it. 2) Data is disparate and scattered among the disparate web 3) It’s more complex, and requires more time to put together, however the accuracy of the data will be higher. 4) Social CRM is still very early, and aggregating all data into a single area is a challenge. 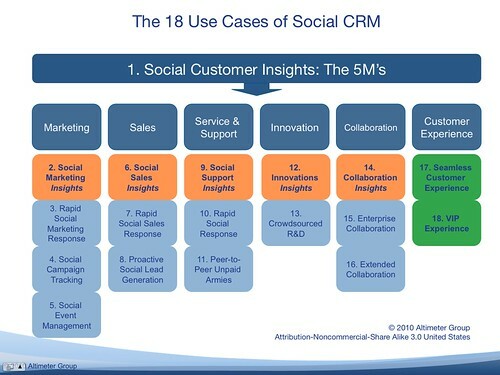 We’ve conducted research and published the following reports on Social Marketing Analytics (slides and recording, and the report) with 3-ex Forrester/Jupiter analysts Social CRM Report, with my colleague Ray Wang which will be the system to house all of this data, along with intelligent filtering and workflows. You’ll need to know more about the formulas to amend NPS, as well as understand the new processes and technologies in Soical CRM which will capture a single user profile regardless of where they publish online. To be clear, I’m not suggesting that we do away with NPS, it still serves a vital function to customer satisfaction, and respect the value it’s brought to the industry. There’s no other single question that can yield so much intention data, It’s a fantastic tool and has advanced the industry, and I know we can build on top of it to reflect the moden web. I’m thankful for the work that Fred Reichheld, Bain & Company, and Satmetrix have done to create Net Promoter Score, and I fall into the promoter score as ‘9’ on the scale, as I’m here recommending you use this methodology, with my additional caveats.